For those of us unable to feel the electric buzz of religious faith that motivates some people to acts of kindness or terror, there are nonetheless times when we wish we could find something above and beyond the mundane demands of daily life to inspire us to be the best we can be without having to join a cult, or a militia, or a book club. Recently the spiritual signature of the Dupont Circle neighborhood went up a notch thanks to a new artwork erected by the Indonesian Embassy. 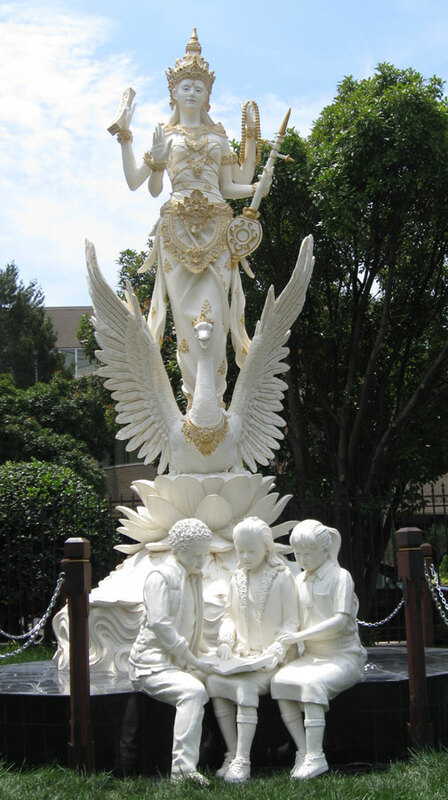 The stunning pure-white statue depicts Saraswati, the Hindu goddess of knowledge and art. I had never heard of her before I happened on the statue gleaming above Massachusetts Avenue. I was fascinated by the exotic image, so markedly in contrast to the usual statues of men in suits that dominate the public venues in downtown D.C.
Because of this city’s history and the tendency to honor military and political leaders in general, there aren’t as many public statues celebrating the kinder, gentler side of humanity. True, there’s an eye-catching statue of Gandhi just a few blocks away from this new work. But Gandhi was a political figure too, worldly and powerful in spite of his humble aura. The goddess Saraswati, by contrast, has the fantastic appearance of a creature of the imagination, far too radiant to be one of us. This probably has something to do with her appeal as a goddess. According to the explanatory plaque beside the statue, the objects which Saraswati carries in her four arms symbolize her areas of concern. There’s a book symbolizing knowledge, a mandolin representing art and culture, and a string of rosary-like beads for “unlimited knowledge.” In addition she rises above a lotus flower, symbol of holiness, and she is accompanied by a swan, another symbol of wisdom, according to the plaque. Style and substance unite in a hopeful image. That’s a heap of symbols to carry around, if you ask me. 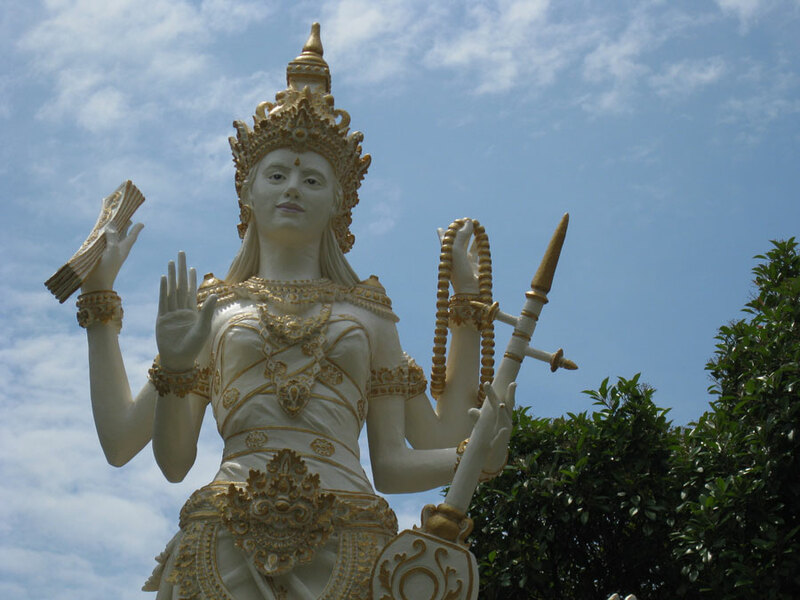 Yet Saraswati appears radiantly serene, as if, even though she knows the job of lifting up folks’ spirits and instilling them with knowledge and wisdom may be a bit of a challenge, she’s undaunted. I like that in a goddess. I imagine having four arms helps. I’ve often thought that if there were a goddess of housework a few extra sets of arms would come in handy. I can’t see anyone worshiping a goddess of cleanliness though. Wisdom, on the other hand, has lofty appeal. So many of the world’s problems seem to stem from a woeful lack of wisdom. The seemingly endless conflicts between various religions hardly appear wise to me. But then, maybe I’m just not wise enough to see the Big Picture. At any rate, I welcome the fresh new face near Dupont Circle, a neighborhood with a rich past of colorful characters and spirited protests. Will She be able to lift the tenor of public discourse in this city of rumors and partisan feuding?